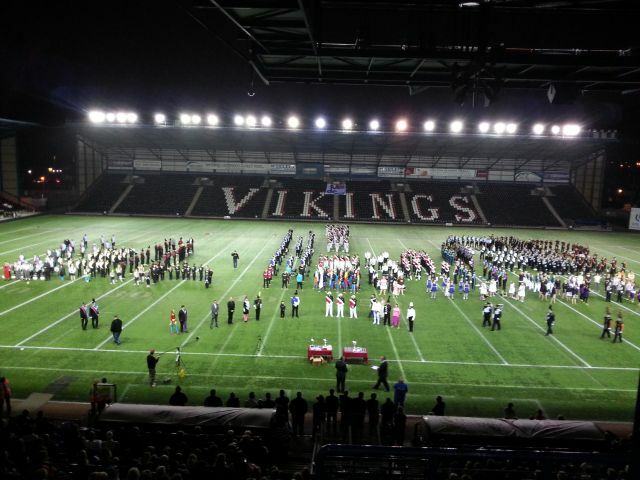 Drum Corps United Kingdom is pleased to announce that the 2014 British Drum Corps Championships will be returning to the Select Security Stadium in Widnes, Cheshire (the home of Widnes Vikings Rugby League and Liverpool Ladies Football Club). Having used the stadium for the first time for the 2013 Championships, at the recent Membership Meeting the Corps gave the venue a huge “thumbs up” and praised the quality of the performance arena which is the latest generation of artificial grass pitch, called i-pitch (intelligent pitch), and so is not subject to the normal concerns of bad weather. The Corps also remarked on how the venue and the surrounding area were ideally suited for our activity being a fully enclosed stadium which enhanced the sound, excellent seating for spectators and ample local rehearsal facilities and so this made the decision by the DCUK Board to return to Widnes for the 35th DCUK Championships an easy one. DCUK is now in discussions with Halton Borough Council (the owners of the ground) about a multi-year deal to secure this fabulous stadium to allow us to continue to showcase the British Drum Corps activity at a venue we can be proud of. More details about the event will be released in the new year. Posted by News Editor on Thursday, December 5th, 2013. Filed under Current News, Drum Corps U.K., FrontPage Feature.